The only annual event in the United States dedicated to the Southern dish of shrimp & grits returns on the weekend of September 18, on Jekyll Island, Georgia. Set in the Jekyll Island Club Hotel’s landmark historic district, the ‘Shrimp & Grits: The Wild Georgia Shrimp Festival’ includes amateur and professional cooking competitions, shrimp boat excursions, shrimp eating contests, cooking demonstrations, races, entertainment, and more. September has been declared “Wild Georgia Shrimp Month” on Jekyll Island and the neighboring Golden Isles, and at the festival some of the South’s best professional and amateur chefs will compete for the award of the “Best Shrimp & Grits” recipe in the country. 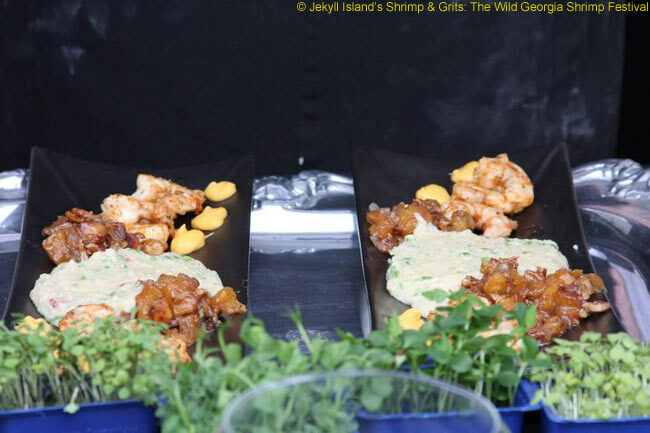 Set amid Jekyll Island’s picturesque Jekyll Island Club National Landmark Historic District, the festival starts on Friday, September 18 at 5:30 p.m. with a “$3 Shrimp Sample Night,” where participants will have the opportunity to taste recipes from vendors throughout the region. Saturday, September 19 will see the Amateur Cooking Competition, which offers festival guests opportunities to taste and judge 10 shrimp & grits dishes prepared by aspiring and self-taught cooks throughout the region. The festivities continue on Sunday, September 20, when the winner of the Professional Cooking Competition will be announced in the afternoon. Visitors can purchase VIP tickets for $35 in advance or learn more about the weekend festivities by visiting www.jekyllisland.com/shrimpandgrits. Been there several times, lots of good shrimp dishes to try, and the chefs come from all over – I talked to one from New York a couple of years ago (didn’t know they knew what grits were up there). Ride the shrimp boat – it’s a blast, especially for kids. 7/26/ll I am writing to find out the dates for the 2011 Shrimp & grits Festival. Please forward along with ticket prices for the entire 2 day event and places to stay. Many Thanks! The dates are September 16 to 18, but you will need to visit http://www.jekyllisland.com/Events/AnnualFestivals/ShrimpandGrits.aspx to get ticket prices and find accommodation options.